Snap’s first hardware product is now available across Europe. Although it is not seeing the same hype as it’s US launch, people are sure excited. About seven months after their debut in the US, starting today anyone can buy a pair of Snap spectacles in Europe. The pair of glasses equipped with cameras will be sold online on spectacles.com as well as the vending machines that were part of the US launch as well. The vending machines will be located in London (under the London Eye) as well as Paris, Berlin, Barcelona, and Venice starting today. Also, they will be priced at £129.99 / €149.99. For those of you who are unfamiliar with these glasses, they are essentially regular shades with a camera on the upper right corner of the right lens. The circle on the left side holds LEDs that indicate a video being recorded. At the press of the button above it, the camera records 10 to 30 seconds of video that is synced to the Snapchat app on your phone, available to be shared or stored in the memories section. The accessories available are the charging case at £49.99 / €59.99 and the charging cable at £9.99 / €11.99. It’s somewhat unexpected that Snap took this long to bring its first hardware product outside the US – especially after the hype it saw during its US launch. Also, in the time in which major hardware manufacturers have introduced entirely upgraded lineups, the Snap spectacles being introduced in Europe are exactly the same as their older US counterparts. Although, this could be an insignificant factor considering the novelty of the product itself. One upgrade that did happen was the ability to buy it online. Initially, the spectacles were only available on the uniquely shaped vending machines only. 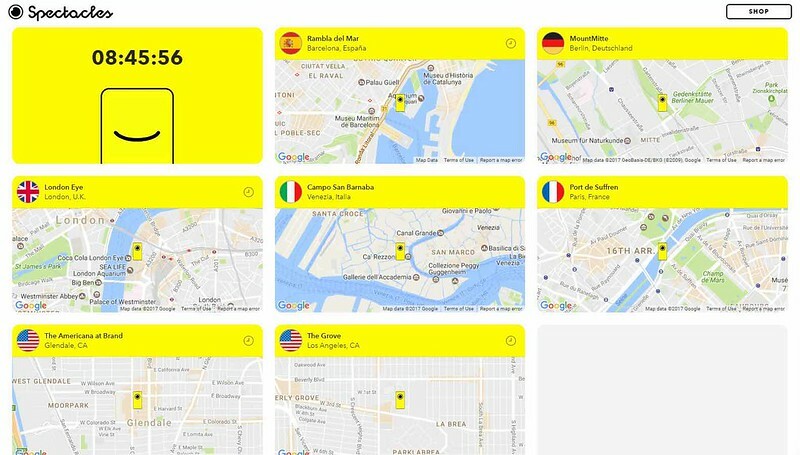 If you happen to be in any of the above cities and intend to see one of these Snap bots, you better be quick as Snap plans to move them around Europe across the summer to more countries like the U.K., France, Germany, Spain and Italy.